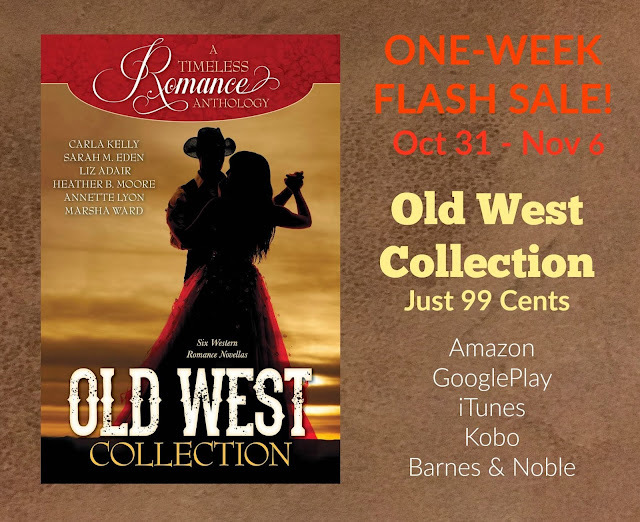 Six Award-Winning Authors have contributed new stories to A Timeless Romance Anthology: Old West Collection. Readers will love this collection of six historical western novellas, all with one thing in common: Romance. In BREAK A LEG, a charming story by two-time Rita Award winner Carla Kelly, hospital steward Colm Callahan is ready to move away from army life at Fort Laramie. His only regret is leaving behind exotic Ozzie Washington, easily the prettiest woman on the post. As a maid to the lieutenant colonel's wife, Ozzie is no wilting flower when it comes to hard work. When the post surgeon leaves for an extended week, Colm must handle several medical emergencies on his own. He pleads for Ozzie's help at the hospital. While they spend long days and nights working together, Colm, a shy man, realizes he can't hide the truth of his feelings for Ozzie. He needs a little help, though. Enter from stage left, Lysander Locke, Shakespeare tragedian on his way to Deadwood. THE SOLDIER'S HEART, an enchanting novella by Sarah M. Eden, follows Gregory Reeves has fallen in love with a woman he’s never met. Her brother’s dying wish is that Gregory checks on his family, and after the war, Gregory is only too happy to meet the woman he’s been dreaming about. Helene mistakes him for a hired hand and sets him to work immediately. As time passes, Gregory finds it more and more difficult to reveal his true connection to her family, fearing that a woman who loathes liars will turn her disapproval on him. HIDDEN SPRING is an enthralling novella by Liz Adair, in which Susannah Brown is just getting her life back together after becoming a widow. She still misses Wesley with a fierce longing, but when she meets his half-brother, Douglas, she learns her heart is not completely dormant. Over the next several weeks, Douglas helps Susannah with repairs on her small ranch in exchange for supper. The exchange becomes more and more meaningful as Susannah realizes that Douglas might be the one to finally heal her heart. THE SILVER MINE BACHELOR, by Heather B. Moore, is a sweet romance between an unlikely pair. Lydia Stone has a checklist for men who qualify as the eligible bachelors in the mining town of Leadville, Colorado. Her new boss, Mr. Erik Dawson, is about to be struck off the list when she sees him coming out of the town brothel. Lydia doesn’t know that Erik Dawson’s sister has been living the brothel lifestyle for years, and he’s set on redeeming her soul. When Lydia discovers Erik’s secrets, she learns that life is not as black and white as she thinks. In Annette Lyon’s delightful story, THE SWEETEST TASTE, Della Stafford hates being a farm girl in the tiny town of Shelley, Idaho. She’ll do anything to live in a big city and experience real city life. Her only regret is that she’d have to leave Joseph behind, the young man who makes her heart flutter. But she's convinced that moving away is for the best; her dreams and Joseph's dreams are too dissimilar. Then Della takes a job as a maid in Los Angeles and must face the truth that what she thought would make her happy and what really will are totally different things. In the captivating novella, FAITH AND THE FOREMAN by Marsha Ward, Faith Bannister is forced to travel west to earn a living as a school mistress in Arizona Territory. Faith soon learns that living the frontier lifestyle of a single woman has many harsh challenges. But when she meets Slim McHenry, she discovers that life doesn’t have to be so lonely. Unfortunately the dangerous Rance Hunter stands between her and Slim, and she must act with courage before everything is lost.